The Center is located inside Teddy Park, at the foothills of the Old City across from the Mamilla Mall and beside the Artists Colony. 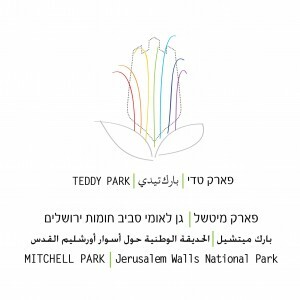 Teddy Park, a gift from the Jerusalem Foundation to the residents of Jerusalem has become one of Jerusalem’s most popular and talked about attractions – A “must see” for all tourists and a favorite hang-out for residents from throughout the city. Part of Mitchell Park within the National Garden forming a basin surrounding the Old City, the park stretches over an area of 2.7 acres. In the heart of the park is the innovative Sylvia Hassenfeld Family Fountain, Israel’s first sound and light water fountain. The park honors the memory of Teddy Kollek, the legendary Mayor of Jerusalem and Founder of the Jerusalem Foundation, via eight stations and a visitors center telling Teddy’s life story. The Kenneth and Ann Bialkin Visitors Center is open daily to the public free of charge and features a 3D hologram film – the Rudin Multimedia Display – presented within a glass pyramid, a unique model of Jerusalem and photographs telling Teddy’s story and the history of the development of modern Jerusalem during his tenure as Mayor. On display in the Center are a number of personal items and artifacts from Teddy’s ancient map and archaeology collections thanks to the generosity of the Kollek family.